At Restoring Order, we think organizing is all about getting creative and making your space serve YOU! 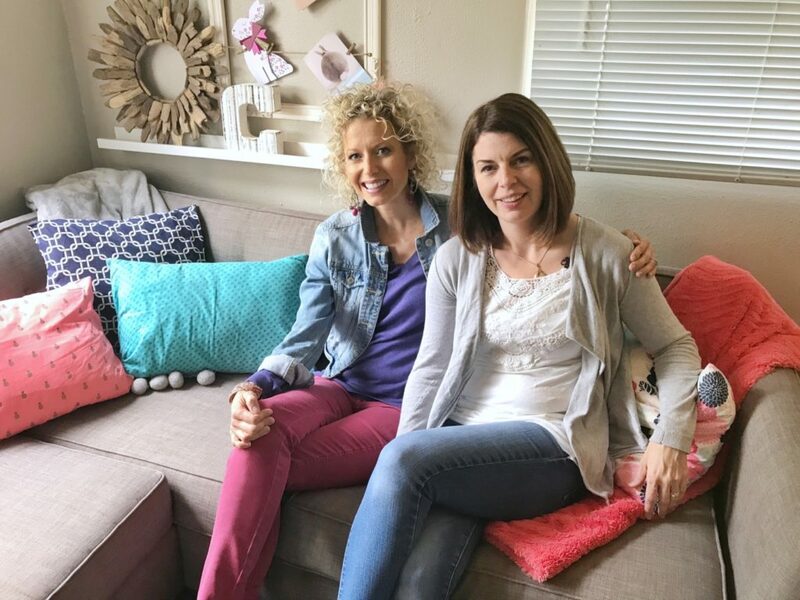 This is why I LOVE sharing the home of our very own Order Restorer, Valerie! Valerie and her family of four live in an adorable 1930’s bungalow. You wouldn’t know they were short on space, however, with the creative ways they maximize their home. 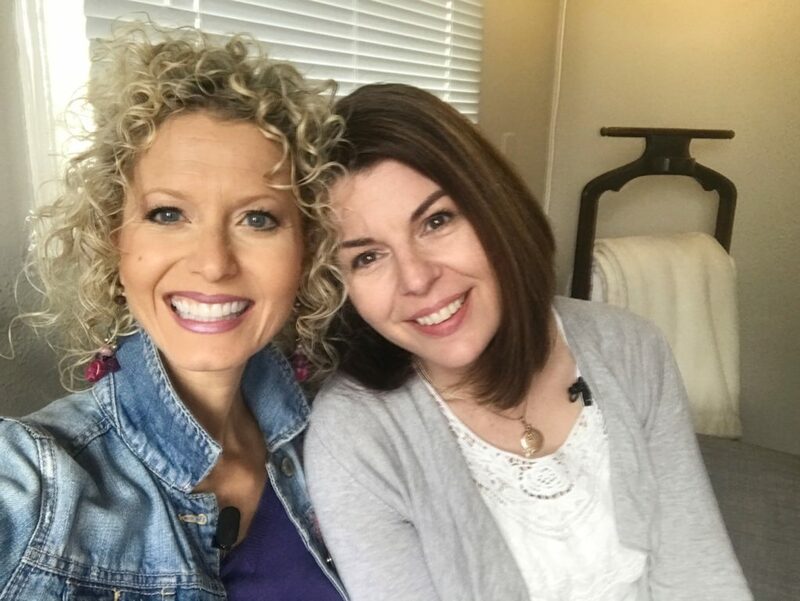 On my latest segment for More Good Day Oregon, Valerie showed us around her home and revealed her creative ways that she lives large in a small space. Most spaces in a small home serve multiple purposes. Valerie’s mudroom is a great example of this principle. The mudroom opens right off the driveway and is the laundry room, shoe closet, backpack area, and the family’s main entry to the home. To accommodate all these functions, Valerie had to get creative and utilize vertical storage. 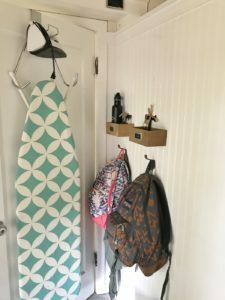 For her two teenagers, Valerie set up a backpack station in the mudroom so their belongings are easy to locate when leaving for school. Both kids have a hook for their backpacks and a cubby above where grab-and-go items are visible when kids are heading out. Having a dedicated place for these items keeps them from roaming in the home and taking up space! Another creative way Valerie has utilized wall space in the mudroom is by hanging laundry baskets on hooks on the wall. This saves valuable floor space! When you are dealing with a multi-use room with limited space, going vertical with your storage will be a life saver! Valerie has a shoe bar in her mudroom, but it isn’t enough storage for the family of four. To compensate, Valerie goes vertical by utilizing the storage cabinets above the washer and dryer for shoe storage. A shelf up near the ceiling and beautiful baskets were used to expand the storage capacity of the mudroom. Clear labeling allows Valerie’s family easy access to these items that are used less-frequently, like seasonally-used sunscreen and bird feeder supplies. 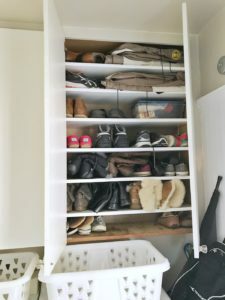 Thus, the shoes that are needed on a more frequent basis are easily accessed in the storage cabinets at eye level, and the less-frequently needed items utilize the less convenient storage space above. When storage space is scarce, give priority to items needed most often. In Valerie’s 1930’s quaint kitchen, counterspace is at a premium. Additionally, the cabinets come down lower than modern cabinets, leaving less space for bulky items such as a coffee maker. 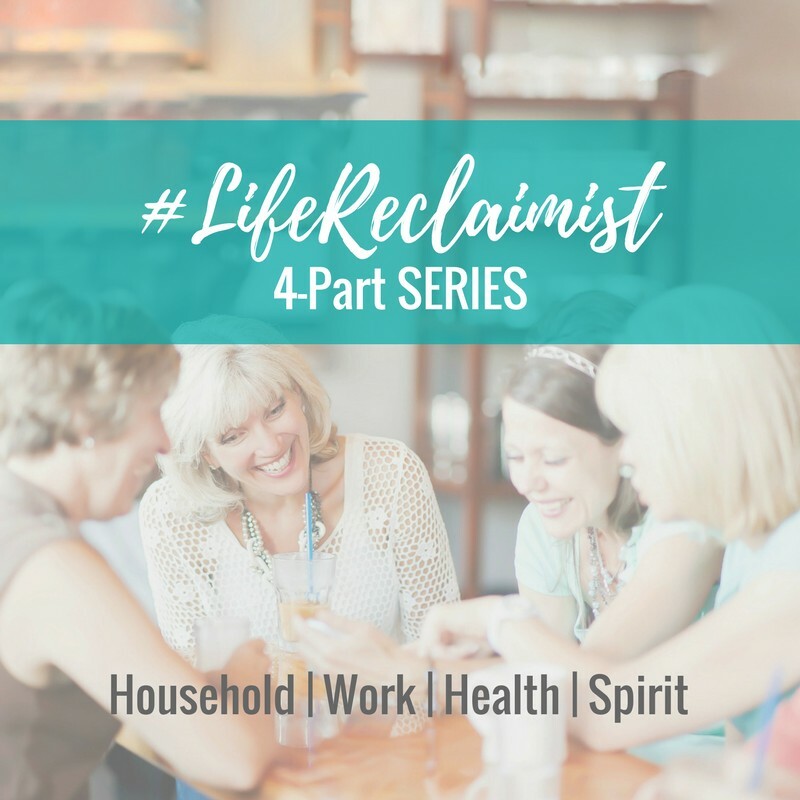 To overcome this obstacle, Valerie went outside the walls of her kitchen and created a beverage bar in her dining room. 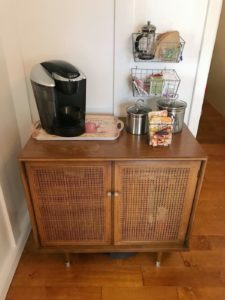 Her beverage bar was made from an adorable small cabinet that matches her retro home. And, again, Valerie utilized wall space by attaching baskets directly to the wall above it to hold tea, cider, cocoa and coffee necessities. Limited counter space did not stop this Order Restorer; her beverage bar became a charming part of the dining room and a convenient way to offer hospitality to guests. 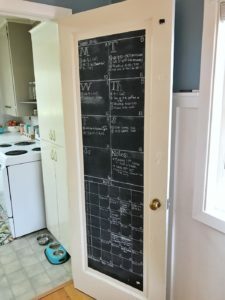 Another brilliant solution for her galley-style kitchen was to utilize her kitchen door for a chalkboard calendar and planning space! Using this large palate, the family can easily track of each other’s schedules and items of importance. Valerie’s home only has one bathroom. With two teenagers and two parents getting ready in the morning, this could be a source of family tension. However, Valerie once again got creative to turn what could have been an annoyance into a charming feature of her home! 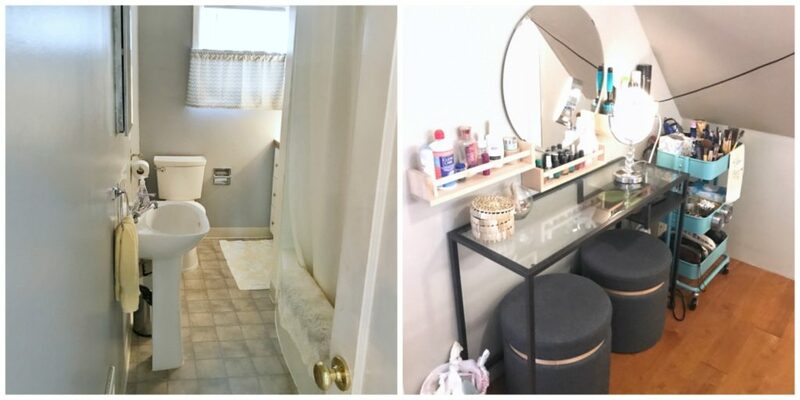 Valerie set up old-fashioned vanities in her and her daughter’s bedroom so much of the “getting ready” process can be done outside of the bathroom. I thought this solution was brilliant! Not only is it fun to have a vanity to sit and primp, but it solves the one bathroom problem with class! As a true Order Restorer, Valerie didn’t simply relocate her toiletries to her bedroom. She thought through what items could live at the vanity and what needed to be portable. She employed a rolling cart for items that she wanted to be able to move from place to place. Genius! Valerie once again utilized the wall space and attached spice racks around her mirror to hold the items that would be staying at the vanity, such as nail polish. 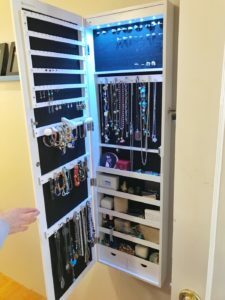 Another space-saving solution Valerie uses is a wall-hanging jewelry case. It’s slim profile minimizes the space it consumes while offering plenty of storage for Valerie’s treasures. Valerie’s bungalow does not have a separate space for a home office. In fact, finding a spot for a desk is a challenge. But, once again, Valerie has created a solution for her family that exudes both creativity and style. In her living room, Valerie designated a cubby system to serve as the household hub. 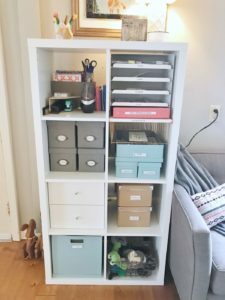 Within it, she set up a Restoring Order style “action center” so she can process the family’s incoming paper in a way that is both functional and tidy. Through careful selection of storage containers (selected for specific office supplies that needed storing), the open-shelf cabinet adds to the décor of the room! Valerie also established a desk system with a long, narrow surface tabletop spanning two 2-drawer file cabinets. Tucked into the surface are two petite and comfortable office chairs for two people to work from this station at a time. Laptops and tablets can be utilized here and then taken back and forth to work. On the work surface, the Restoring Order “projects” area was set up for Valerie’s family project folders. All active pending paperwork is stored here in colorful, patterned files inside a wicker hanging file box. When living in a small space, you don’t want to feel boxed in and tire of the space. 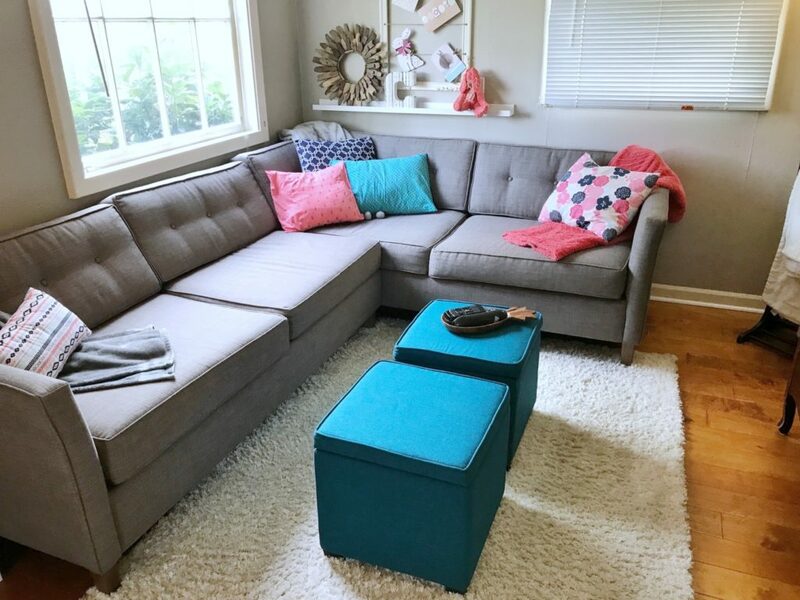 Valerie has kept things fresh and interesting by selecting neutral furniture and introducing rotating pillow covers that can be swapped out for different seasons and holidays. 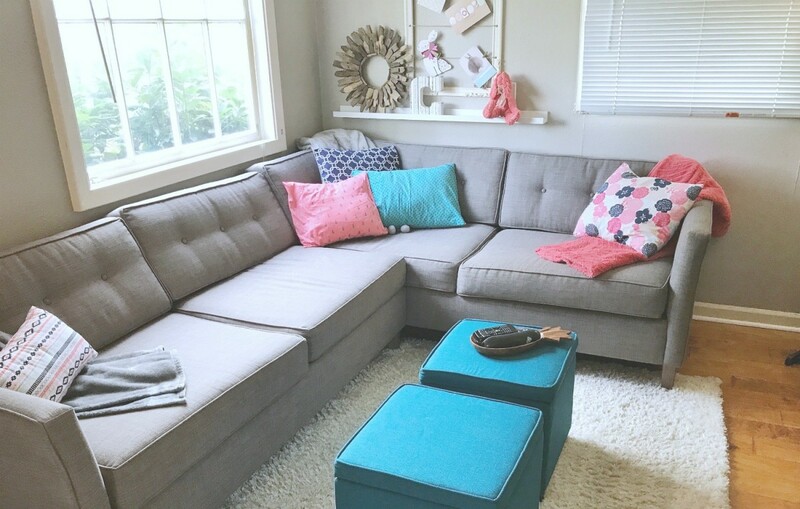 Instead of having to store bulky pillows when they are out of season, she simply changes the covers to add a fresh pop of interest to her living space. I hope you’ve enjoyed the tour of Valerie’s adorable home as much as I have. As you can see, with a little creativity and efficiency, you can live large in a small space. Join us Order Restorers in getting creative with your space – large or small! 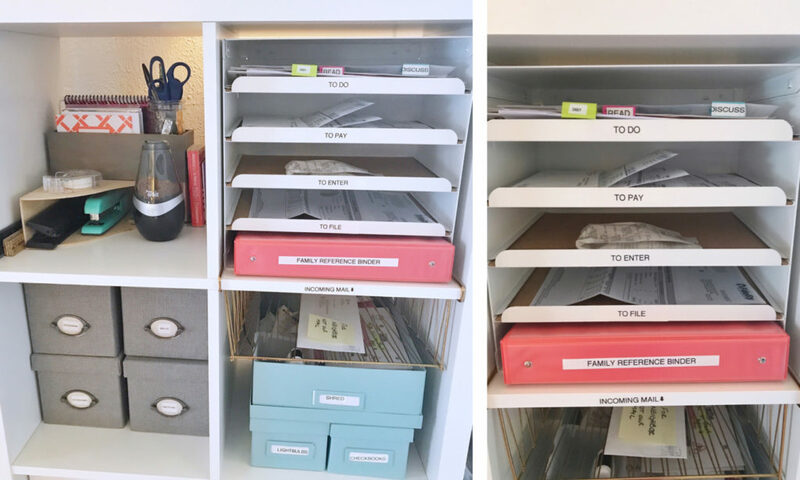 Visit our DIY Organizing Board on Pinterest for more innovative organizing ideas!